How to run a REST project request in SoapUI? A request in a REST project represents a HTTP request of a specific GET or other method for a specific resource provided a REST API. This tutorial shows you how to run a request in a REST project in SoapUI using iextrading.com API as an example. 2. Click "File > Import" menu to open your SoapUI test project stored in "\fyicenter\REST-Project.xml". You see the REST project displayed in the project explorer panel on the left. 3. 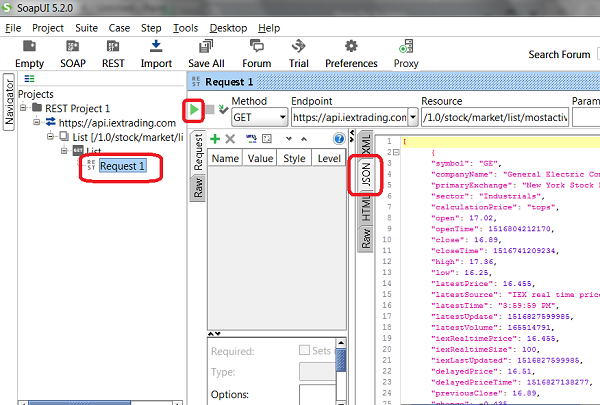 Double-click on "Request 1" under "REST Project 1 > https://api.iextrading.com > List [...] > [GET] List". You see the "Request 1" window. 4. Click the "Run" icon. You see the request executed. 5. Click the "JSON" tab on the response panel on the right. You see the response displayed as the JSON data format. 6. Click "File > Save All Projects" menu and save it as "\fyicenter\REST-project.xml".